A beautiful RV Resort and Campground in a private little valley in the resort village of Radium Hot Springs, catering to families and seniors looking for a quiet and carefully maintained park. The property has huge lawns, lots of flowers and big old trees situated between the Rocky and Purcell Mountains. Deluxe RV pads are offered. Amenities include fully-serviced bathrooms, laundry and playgrounds. Seasonal and long term rentals available. The home of a thousand faces; many of Rolf's sculptures are done by a unique carving tool - the chainsaw. Marshes adjacent to the Columbia River between Golden and Invermere form one of largest contiguous wetlands in North America. Culture and history of Ktunaxa Nation & Anatomy of Land exhibit is offered at the Visitor Centre. The Highway 93/95 junction is the southern entrance to Kootenay National Park offering several points of interest. This area is home to hundreds of kilometres of world-class trails: Old Coach, Lake Lillian and Nipika Cross River Canyon Trails. 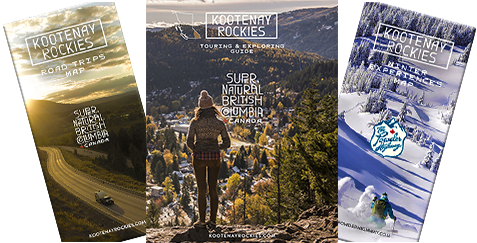 A number of biking events also take place such as the Kootenay Krusher - early-June. Situated in the Purcell Mountains, this park continues to draw climbers from around the world to its airy, glacier-sculpted granite spires. A famous attraction for Radium Hot Springs - The Headbanger Festival takes place the first weekend in November during the sheep's annual rut. Dramatic scenery and soothing water to rejuvenate. Nearby Radium Hot Springs pool.